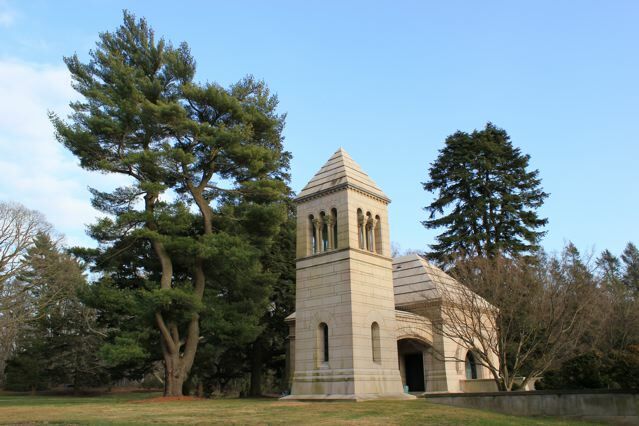 The Pratt Mausoleum designed by William B. Tubby in the early 1890s in Glen Cove. Charles Pratt is interred in a sarcophagus (seen below) and rests with seven of his eight children and numerous grandchildren. 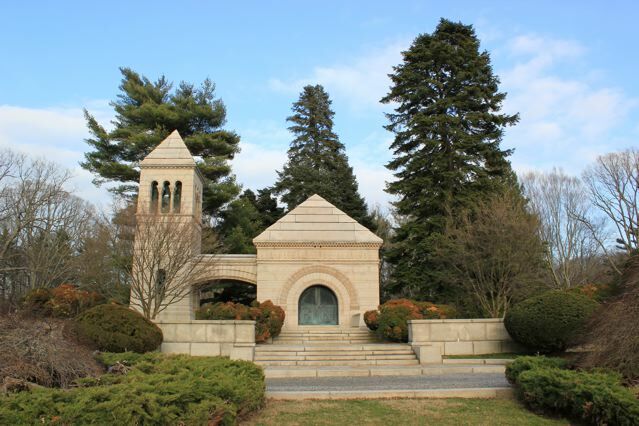 Click HERE to see the Pratt Mausoleum on google earth and HERE on bing. Photos courtesy of Eddie Crowley. Are those security sensors or fans for drying water leaks? Because I posted today I will receive all the glowing comments on C. P. H. Gilbert. Thank you, Ed Crowley, and Zach !!! These private mausoleums fascinate me . . . and I've been curious about this one for the Pratt family. Like OGD, this building has always fascinated me. I assume that the mausoleum is the squat building to the right. What is in the tower? Bells, I assume, but would love confirmation. 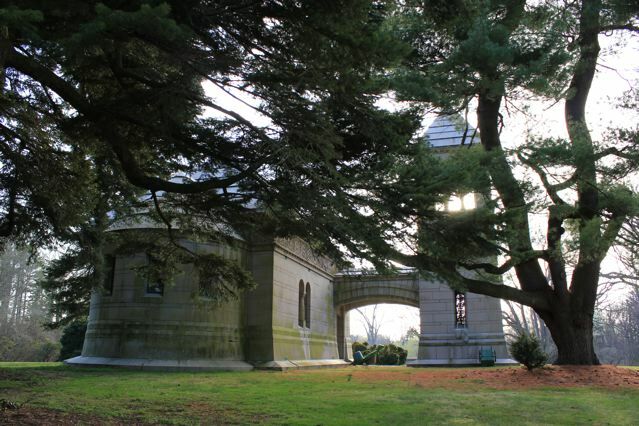 I have also heard that the arch connecting the mausoleum to the tower is called the "Bridge of Sighs". Is the name wholly allegorical and is the arch, in fact, a bridge? Happy vaca Zach, if that's what you're taking. Well deserved. Someone is going to ask himself, What would it cost ....? At the time it was built, c. 1895, the stated expense of the building was $150,000 -- including two thousand tons of stone, mosaics by L.C. Tiffany, at least one stone relief by Herbert Adams, and who knows what else. P.S. For anyone who doesn't know, The Bridge of Sighs spans a canal in Venice, where it attaches the Doge's Palace to the ancient prisons. What, no OLI for a week? This is quite a building--some really marvelous details, a bit of mystery.. So which child isn't there? One guesses it was Helen Dane? Ancient, the problem with those 'stated figures' is that they are almost always press exaggerations. I've recently been doing some research about a house that for now shall remain nameless. Always claimed to have 100 rooms, including 30 for servants, the truth was 58 rooms, 16 for servants. 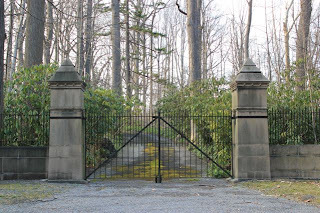 The cost always stated as a million and one half, the actual invoices from first shovel for foundation to last curtain hook was under half a million 1916 dollars. This is repeated over and over for hundreds of the most famous houses and buildings. 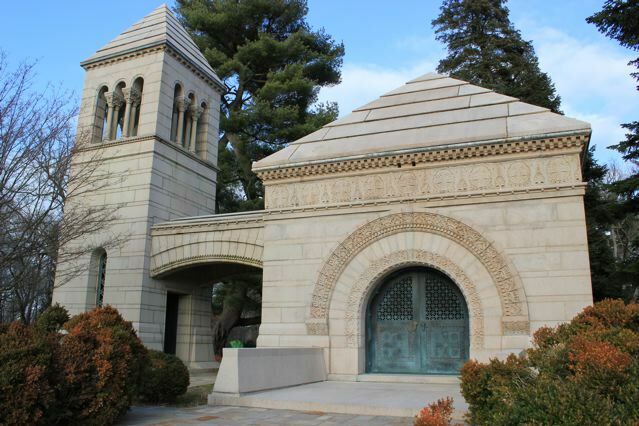 I'm even going to go out on a limb and venture that it would have been impossible, except under government supervision, to make that mausoleum cost 150,000 in 1890. Discuss. Wonderful complex and located in a beautiful park-like setting. Could think of worst places to spend eternity. No posts till Friday? Now withdrawl from OLI begins. will probably be placed there next May. drives will be systematically laid out. Who knows where the numbers came from, but I'd be more inclined to take the first one, since it appeared in a professional publication. P.S. TDED -- What do you think it would cost to build today -- assuming one could find the stone masons to build it to comparable standards? Good question Ancient. I'm hardly an expert on modern construction costs (I'm still staggered by a year old estimate for a very simple repair and renovation of a 16x14 kitchen and accompanying pantry & shed), but it would seem that upward of 4 million would not be off the mark. What's your figure? Assuming it was built in just the same way and to the same standards, four to six million, depending on the type of stone used. PLUS the cost of artwork (mosaics, carvings, etc.) And if there are bells in that tower, it would be on the high end of the range. BTW, this version of the interior picture does a better job of showing how the Pratts are buried. And does anyone know if the "Bridge of Sighs" at the Pratt Mausoleum is actually a bridge (it appears merely to be a connecting arch in the photos)and why it was so named, bearing no resemblance to the Venice monument? By the way, I'm told that Pratt descendants continue to be buried there. I've belatedly realized that I can't possibly make an estimate without knowing how the building was constructed. "Two thousand tons of stone"? Doesn't that sound as if they didn't use architectural veneers? So my revised estimate is -- "a god-awful-amount of money." Off on a tangent a bit....While the estimate of 4-6 million is probably realistic considering the staggering cost of commissioned artwork and the craftsmanship involved, it emphasizes the incredible budget it would require if one could possibly fathom rebuilding a home like Harbor Hill, Beacon Towers, Knollwood, Pembroke or even a Laurelton Hall in today's dollars. The overwhelming task, if one could even gather the stone masons, materials and artisans to attempt such a project only reminds one of what an immmense loss each demolition truly costs when you view the homes featured on this blog while Zach is taking some time off for R&R. And while we're on the endlessly fascinating topic of other people's money, does anyone know how the Mausoleum is maintained? Was an endowment created when it was built or do they "pass the hat" among Pratt descendants when the grass needs to be mowed or roofed patched? 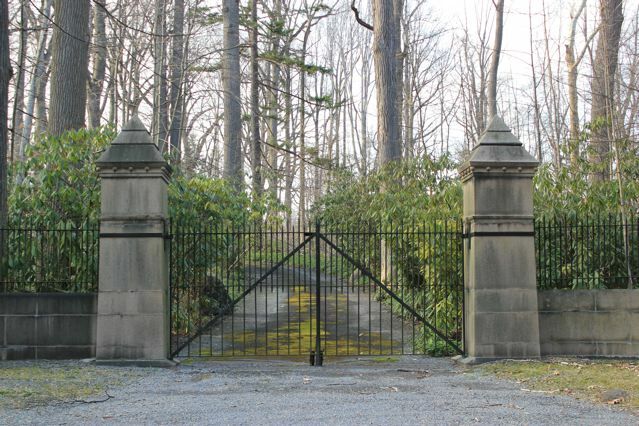 A bit off topic, but I remember reading a few years ago that descendants of "Tin Plate King" William Leeds, a plutocrat of the last century, had sold the family mausoleum at Woodlawn, I believe, for an enormous sum. I can't recall what they did with the poor old guy's mortal remains, but I don't imagine he would have been happy about it. Magnus, according to one of Ancient's links, an endowment of 60,000 was set up---a tidy sum in the 1890's. 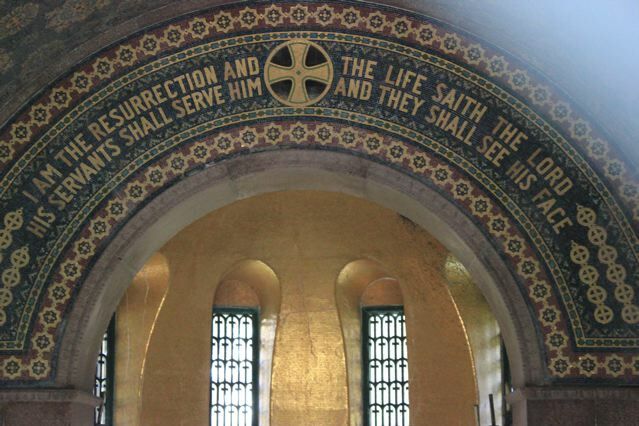 Magnus, here's a bit about the Leeds Mausoleum--the photo caption contains salient information. Leeds, of course, purchased Rough Point in Newport from Frederick Vanderbilt. Later, Leeds's widow, by then a princess, sold it to James B. Duke. "... an endowment of $60,000 was set up---a tidy sum in the 1890's." It certainly is a lovely architectural offering. Cemeteries appear to be the last hold out from the tear down movement. Oh, that Dizzy Dilettante, forever forgetting his links..
And Magnus, you'll like this, about another resident of the Leeds Mausoleum. I am also sure this will please DED immensely....when it came to selecting an architect to design his permanent home, FW Woolworth strayed from CPH and utilized the services of John Russell Pope. His Egyptian styled tomb pictured below, a fairly wonderful exotic design. Actually, DED, I believe that Nancy was buried elsewhere at Woodlawn: When William Leed's grand-daughter sold the Mausoleum, she explained that it had been built to hold eight, but that her grandfather was the only "resident". She didn't want him to be alone for eternity, so she removed him to the cemetary where his parents are buried. Such concern for the feelings of the dead. A wonderful little book for those of you interested in such things is King Lehr and the Gilded Age by Elizabeth Drexel Lehr, Lady Decies. It has some very good, first hand descriptions of well known personages of the era. I remember her depiction of Nancy Leeds, later Pricess Christopher of Greece, as a silly, heedlessly extravagent woman, forever ordering nonsensical luxury items like jeweled garters for her stockings. The penultimate gilded age nouveau riche. I was lucky enough to visit the interior when Dormer House (I believe) was open as a Designer's Showcase (the parking/buses were on the mausoleum grounds). It is actually quite a cozy little chapel, not grim at all, and one could easily see spending an afternoon there in quiet contemplation. "penultimate gilded age nouveau riche"
No one has yet observed a most glaring inconsistency of this structure. 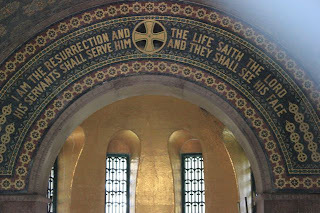 The inscription "I am the Resurrection and the Life saith the Lord. His servants shall serve him and they shall see his face." 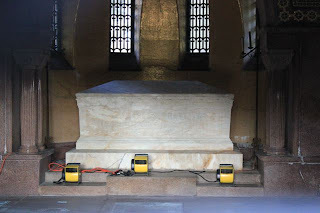 The supposed servant lived lavishly in gilded palaces fit for a king and was laid to rest in a king's tomb. In contrast, the one he served, a true King, lived an itenerent vagabond life his final three years without any possessions or residence and upon his sacrifical death his body was laid to rest in a borrowed grave. The self proclaimed servant lived and died as a king for the King who lived and died as a servant. This is a beautiful structure. I am just humored by the lack of circumspection of its owner and occupant. See what happens when Zack takes off.......Oh boy we are venturing into religion and politics? IMO, I dont think he would agree with you that he didnt "serve" his king. While many men of his era have been labeled robber barons and vilified, i.e., Jay Gould, some recklessly ruthless in their business dealings and affected many lives, there are of course notable exeptions. Even Carnegie with his University endowment, charities and more importantly his effort to build free libraries, almost unheard of in his time, cannot be painted as all bad. Charles Pratt founded Pratt University in New York and while it has become a leading art and design school, it started out as a trade school to teach under priviledged students a trade and more importantly provide them with a career. They had classes for machinists, photographers, librarians, etc. and I think if one has the spirit and generosity to put in motion such a gift, utilizing their own fortune, (no government assistance and tax deductions involved) then I dont begrudge them lifting fanciful scripture to emblazen their tombs with. Just my opnion. (BTW He also contributed heavily to Adelphi University and many churches in Brooklyn). "what happens when Zack takes off, we are venturing into religion and politics...."
1.next to the last: the penultimate scene of the play. 2.of or pertaining to a penult. Archibuff, I didn't mean to imply that Pratt didn't serve his lord, nor was I passing judgement on the fruits of his life. I was merely noting the contrast in material expressions of the servant versus the one he served. I also admire and enjoy the works of architecture for which he is responsible and the expression of relaitonships that appear to have existed among his family. he appears to have been a very benevolent patriarch. Hmmm, I wonder where I've heard of that before? 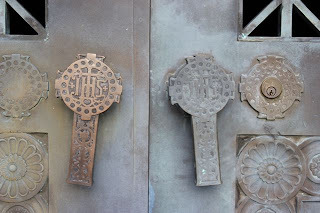 Does anyone know the number of estates that contained chapels either within the home or on the grounds? I only know of Roslyn House, Laurelton Hall & Wheatly. I presume the isolation of these early estates required chapels to serve both the owners and the many families in service on the estates. Some of you may remember last August I posted a picture of my Australian Shepherd 'Otto' when he underwent knee surgery for a partially torn cruciate ligament that he suffered that spring. A setback in October ultimately led to another surgery in January to fix the suture material used to stabilize his knee. The recovery time is 8-12 weeks but Otto just wasn't getting better the way he should have. There were constant visits to various veterinary orthopedic surgeons here in NYC over the course of the last 5 months trying to diagnose just what exactly was going on. None of them could. On Tuesday we went down to Maryland to see Dr. Sherman Canapp at the Veterinary Orthopedic and Sports Medicine Group. Dr. Canapp is considered to be one of the preeminent veterinary orthopedic surgeons in the country. Within minutes he diagnosed Otto with a fairly significant partially torn groin muscle...the cause of all of these months of trouble. Dr. Canapp also performed arthroscopic surgery on his injured knee just to check if there were any additional issues which thankfully there were not (besides the previous rupture). We will have to go back to Maryland in 2 weeks or so for PRP injections into Otto's muscle to assist with the healing along with a few months of physical therapy but Otto should be able to recover. Oh and service will return to normal tomorrow. Thanks for the update on Otto, Zach; I hope you both are doing well after your journey. As you can see the gang kept busy in your absence, but that was inertia ... we need fresh fodder. Welcome back. So glad to hear Otto will be well. "Within minutes he diagnosed Otto.." is music to my ears! Ah, I'm reminded of the great Shakespearean phrase, remember it [with a smiley face]? "Diagnosis is all." So glad you got a good one! The things we do for our cats as well, and the one I have in mind is also named Otto. He broke his leg so bad the Vet wanted to amputate, but her father, who has much more experience with this types of thing, said, no, he thought he could fix it with an operation. Thousands of dollars later, Otto has all four legs. Hope your Otto does well too! Underhill farm had a chapel, also.